Real Data’s April ‘18 report for the Triad shows that occupancy is down a tad is better than it was a year ago, although down a tad in the last six months, while rents rose quickly in the last year. Their data shows that vacancies have risen from 5.2% to 5.5% since October ’17, but are still below the 6% reported one year ago. Average rents are up 4.2% over the last year, with the average rental rate now at $842 vs $794 a year ago. Real Data’s forecast for the next year is that vacancy rates should remain below 6% and rents should continue to grow at a 4-5% annual rate. According to data released by Apartment List, median rents (July,2017) in Winston-Salem and Greensboro were among the lowest in the 100 largest US metro areas, but they are growing. Winston-Salem came in at the 94th slot, with median 1BR rents of $640 and 2BR rents of $780. Greensboro came in at the 85th slot, with median 1BR rents of $710 and 2BR rents of $840. Greensboro’s rent growth wasn’t as spectacular as its neighbor to the west, but 0.5% from June to July (50th in the country), and 3.3% from July, 2016 to July, 2017 (43rd in the country) still beats a stick in the eye. One of the more interesting findings in this expansion can be found in the demographic statistics. Data on households shows that non-family households have grown at a disproportionately faster rate than family households. Non-family households include singles, roommates and any kind of cohabitation arrangement that does not include marriage or children. The graph below clearly shows that this divergence started when the housing market collapsed, but it continued throughout the subsequent eight years. This chart illustrates the common notion that Millennials have put off starting a family and buying a home. It also explains why the apartment market has thrived over the last 10 years, expanding by 12 percent from 2007 to 2016. Looking at the metros shows a somewhat consistent pattern: those with the highest non-family household growth had some of the highest occupancy growth rates. These include Austin, Greensboro/Winston-Salem, N.C., Houston, San Antonio and Charlotte, N.C. Apartment occupancy in these metros grew by 20 percent or more from 2007 through 2015. However, these metros saw high overall growth rates in population and households as well, so occupancy growth was not necessarily driven by the non-family household growth trend. 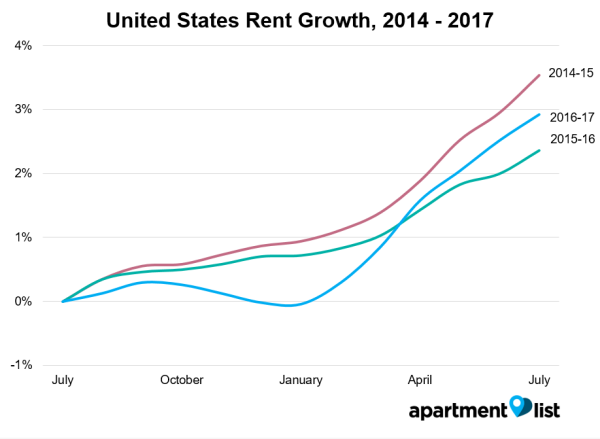 Thus, one could conclude that rents are driven more by economics—job and income growth—than demographics, which still drives occupancy. In short, the demographic shift that we have seen these last few years—fewer families and more “non-families” has changed the urban landscape dramatically. Nevertheless, the property markets are still ruled by economics, which may or may not move in step with the demographic changes. What they’re saying in a nutshell is that the apartment market here in the Triad has a strong occupancy rate due to demographics (growth in households) but rents are suppressed due to economics (our local job and income growth is weak). Bottom line? Until we have more and better paying jobs here in the Triad our rents will remain low relative to the rest of the country. The Yardi Matrix real estate research group reported Monday that Triad rents grew 3.8 percent in July compared with July 2015 — but that’s 1.2 percent lower than the national increase of 5 percent. U.S. multifamily rents inched up in August as the anticipated deceleration in growth started to take hold. Average U.S. rents increased by $3 in August, to their eighth consecutive monthly record of $1,220, according to Yardi Matrix’s monthly survey of 120 markets. On a year-over-year basis, rents were up 5.0%, which is down 50 basis points from the previous month, 110 basis points from April and 170 basis points from the recent peak last October. Even though overall rent growth is cooling, fundamentals in most of the country remain strong. Occupancy rates have declined slightly, but they remain extremely high across the country. Job growth has slowed a bit, but continues at a pace of roughly two million per year, enough to keep apartment demand generally robust. The number of metros with outsize year-over-year rent gains has declined to a small number compared to the second half of 2015 and early 2016, but 18 of Yardi Matrix’s top 30 metros—60%—have seen solid growth of between 4 and 7% over the past year. Rent increases were led by Sacramento (11.9%), Seattle (9.3%) and the Inland Empire (9.2%). The recent deceleration has been most pronounced in some technology-centric metros, which are coming back to earth due to the combination of waning demand and affordability issues in the face of growing supply. Despite the growth in prices compared with last year, however, Greensboro offers some of the most affordable apartments in the state. The median rent for a two-bedroom apartment in Greensboro is $800, making it seventh in the state compared with Asheville’s median rent of $1,210. Median rent for a one-bedroom apartment in Greensboro is $690, according to the survey. In High Point, median rent for a two-bedroom apartment is $820 and $680 for a one-bedroom. And in Winston-Salem, the median for a two-bedroom apartment is $750. No information was reported for a one-bedroom apartment. Describe the national demographic shifts that are driving apartment demand and explore how the Triad measures up? Provide an overview of recent market performance measures in the Triad, including net absorption, vacancy, and rents; how does this compare to other markets in the Southeast? Look at the inventory of apartment development by Submarket; where are the hotspots? You can also get a full report from Real Data, including numbers on individual properties and breakdowns by submarket (Central Guilford, Northwest Guilford, Central Forsyth, etc. ), by visiting their website at www.aptindex.com. According to Axiometrics the Winston-Salem apartment market had the second lowest average rent in the country- $649 – in the month of March. The only market with lower average rent was Tucson, AZ ($633). Greensboro was the eighth lowest at $708 per month in March. How do these rents compare to the top 10? Well at the very top you have New York at $3,251 and San Francisco at $2,659.